Do you know what your dog's body needs to thrive? Dog nutrition, like human nutrition, can be overwhelming to navigate and hard to know who to trust. There are many differing opinions, and to top it off, businesses are very good at marketing and playing off of emotions and common perceptions. Can Dogs Have Too Much Fat? Part 1: Are Dogs Carnivores? A carnivore is defined as an animal whose nutritional requirements cannot be met with plant protein alone. This means they need primarily animal protein/tissue to thrive. They require animal protein to provide energy and a full spectrum of essential amino acids to build muscle and support skeletal structure. Anatomical evidence shows that dogs are just as much carnivores as their ancestral predecessors (wolves). The carnivorous nature of dogs is evident based on their obvious physical attributes. Teeth and jaw shape, as well as their digestive system, are specifically designed for tearing and breaking down flesh. Dogs are equipped with sharp, serrated molars and a wide-set jaw that moves vertically to slice meat like scissors and allow them to swallow large chunks. Omnivores and herbivores have the enzyme amylase present in their saliva, but carnivores can only produce this from the pancreas and in small amounts in the intestinal tract. This enzyme is meant to kick start the breakdown of starches. Without amylase present in the saliva, the pancreas is responsible for producing amylase to process carbohydrates, which can tax the pancreas if a heavy carbohydrate diet is fed. Carnivores have a larger stomach capacity and a shorter digestive tract, allowing them to process larger portions quickly; Dogs are no exception. They also have a very acidic stomach environment. The acidic nature of a carnivores digestive system is required to efficiently break down larger quantities of proteins and fats. In addition to quick digestion, the acids in the digestive tract also help to eliminate the bacteria present on raw and decomposing meat. 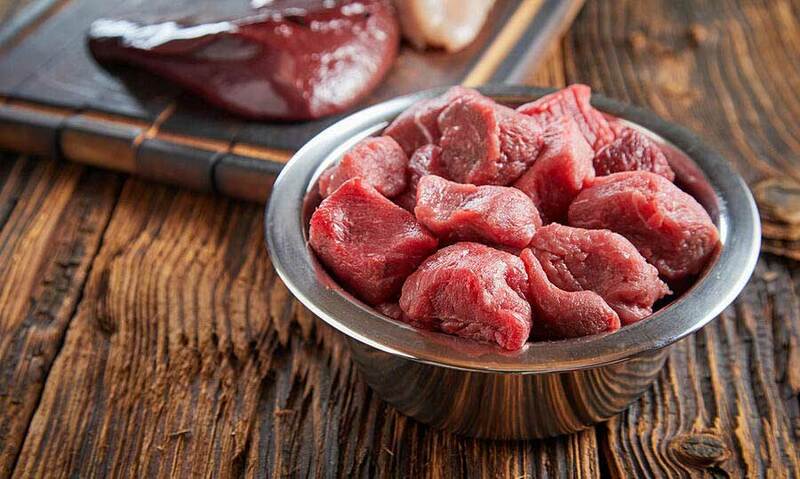 While raw meat may not be a staple in your dog's diet, it does help to eliminate the bacteria that can be present in their environment, their food, and even their treats. Carnivores have a short, efficient GI tract which is made for processing proteins and fats, but they are also capable of processing plant matter. However, the quantity of minerals and amino acids is much more abundant in protein sourced from most animals, and the quality is higher. 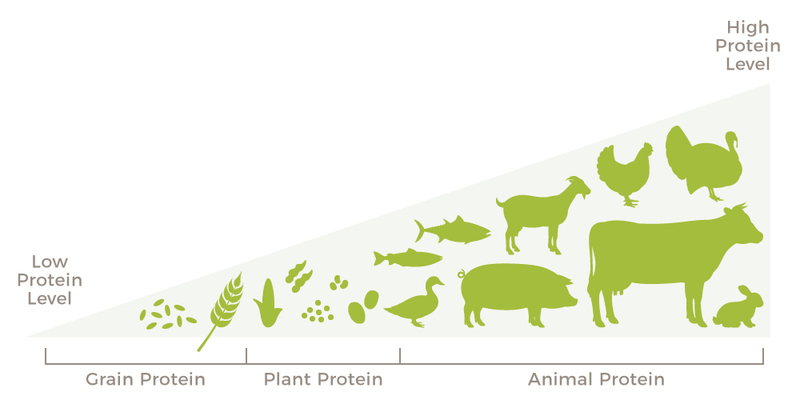 Plant protein makes up a portion of the protein content in any dog food, but the majority of the protein source should be from at least one animal source. For plant matter to be easily digestible, it must be partially processed to remove the outer casing, shell, or skin, made of cellulose, which is indigestible for carnivores. Ground, mashed, and even cut up produce will digest quicker than those fed in their whole state. These are two terms that will be used throughout this guide to help categorize different types of nutrients required in your dog’s diet. Macronutrients are the structural caloric components of food. Proteins, carbohydrates, and fats are all examples of macronutrients. Micronutrients are the nutrients that the body acquires from digesting macronutrients, like vitamins, minerals and amino acids. What is protein used for? Protein is required in a carnivorous diet. It plays a role in every part of the body by providing energy used for building and maintaining muscle mass. Protein also provides amino acids and minerals to support all systems of the body, like skeletal structure, immune system, hormone production, and healthy cell growth. All enzymes are made up of proteins. These enzymes are used to support all metabolic functions throughout the body. Antibodies and hormones, which are used for protection, healing, and maintenance of normal body function, are made of proteins. Proteins also assist in transporting molecules through the bloodstream and regulating pH balance in the body. We hear a lot of talk about amino acids and how important they are in your pet’s diet, but what are they and what do they do? Amino acids are the building blocks of protein. Altogether there are over twenty amino acids, ten of which are essential to dogs, and eleven for cats. Essential means that the body is unable to produce it or at least not enough of it to support normal function, so it must be acquired through diet or supplements. Many of these essential amino acids get more recognition than others, but all of them are required to keep your pet healthy. Dietary sources of essential amino acids are found in proteins, with the highest concentration found in animal protein and lower concentrations in vegetable and grain proteins. Animal protein provides a complete spectrum of essential amino acids, all of which are required to maintain and support all of the body’s functions. They are a chain, so when one of them is missing the rest can’t perform adequately. Protein can also be found in plants. Although plants do provide digestible protein usable for energy, plant sources lack high enough levels of many of the essential amino acids required in a dog’s diet. This is why it is recommended to have only a portion of your dog's proteins coming from plants and the rest from an animal source. Indicative of poor or cheap quality, many brands use plants to increase their food’s protein content and give consumers the perception of high quality and high animal inclusion. Be cautious of where your macronutrients are coming from. Bioavailability is a term used to describe the ability of a nutrient to be absorbed by a living organism. The term bioavailability is commonly used to indicate the quality of a macronutrient. Meat often has a higher biological value than most grains, furthering the argument that dogs are carnivorous in nature. When choosing a dog food, knowing how bioavailable a nutrient is to the body, and what factors can raise or lower the availability of that nutrient, can help you decide which diet will best suit your dog’s needs. AAFCO, the Association of American Feed Control Officials, doesn't currently have regulations regarding the digestibility of pet food, so it can be tricky to determine if the food you choose has a high biological value. Many food companies run feeding trials to measure their foods digestibility, but to get an idea of how biologically available your pet food is, look at individual ingredients. This isn't a perfect system, but it may help you weed out some poorer quality ingredient choices. For example, eggs have a very high biological value, meaning that they are easy to digest and the nutrients and benefits of eggs are easily absorbed and utilized by the body. Many high-quality diets use multiple proteins, including eggs, to offer a wide variety of nutrients. Eggs, although generally not the main source of protein, are often added to boost the bioavailability of the food and ensure that the dog is receiving the appropriate quantity and balance of amino acids, energy, minerals, and vitamins. *This table represents approximate values; biological value can differ depending on the processing method of ingredients. These values are based on human studies, there are currently no conversion values available for pets. Absorbable carbohydrates are immediately usable as an energy source. Your dog will use these to metabolize and digest calories. Absorbable carbs are quick calories and should be limited in the diet because of their rapid effect on blood glucose levels. Digestible carbohydrates, or starches, must be broken down by enzymes in the stomach to be converted into absorbable carbohydrates. Omnivores and herbivores use the enzyme amylase in their saliva to start breaking down starches quicker. Carnivores do not have this enzyme and rely on stomach acids like hydrochloric acid to break down starches, slowing the effect that carbs have on blood glucose levels. Although they are nutritionally superior to absorbable carbohydrates, starches should still be limited in the diet as carnivore energy should primarily come from protein and fats. Fermentable carbohydrates can be used by intestinal bacteria to aid digestion. These are known as prebiotics. As the carbohydrate ferments, it releases food for the healthy intestinal bacteria, aiding in maintaining a healthy gut flora. 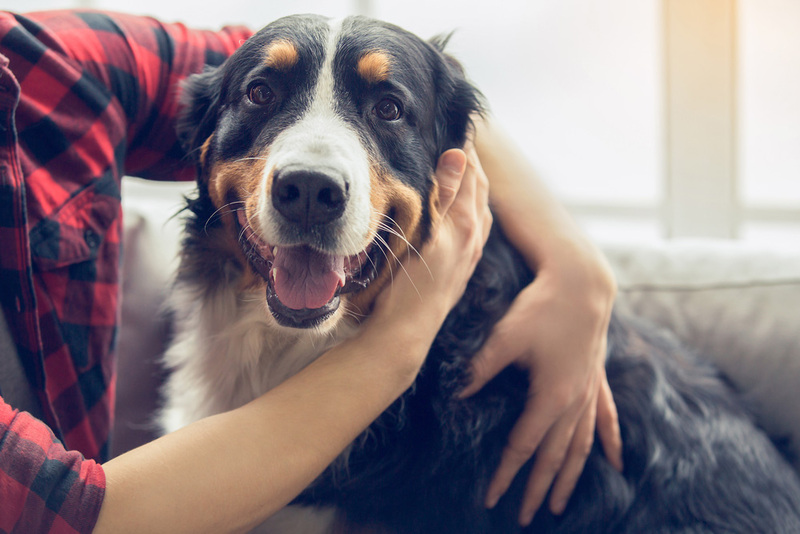 Only certain types of bacteria can survive your dog's stomach acid, so helping them replenish their own digestive bacteria is important for optimal digestive health. Non-fermentable carbohydrates are strictly a source of fibre. Fibre does not break down in the digestive tract, instead, it acts as a bulking agent for waste removal. Fibre is best sourced from fruits and vegetables rather than partially absorbable and digestible carbohydrate grains. Sugars are a source of absorbable and digestible carbohydrates. Their purpose is to provide immediate energy to the body for metabolism and digestion. Common types of sugars found in pet foods are fruits, cereals, and potatoes. Too much of the wrong sugars in your pet’s diet can lead to an overgrowth of bacteria in the small intestine, as many bacteria feed on sugar, potentially causing unhealthy bowel movements. Any sugars that are biologically unavailable to your dog's body end up feeding all of the bacteria in the digestive system, good and bad. Starch is a digestible carbohydrate, similar to sugars. Starches can be used as energy, but need to be broken down by digestive enzymes into absorbable carbohydrates and are absorbed into the small intestine to be properly utilized. Common starches found in pet food are rice, potatoes, wheat, and corn. Because of the extra work the body has to do to utilize them, starches put unnecessary strain on the digestive system and can cause digestive upsets when used in excess. Fibre is beneficial for digestive health. Insoluble fibre adds bulk and speeds up movement through the digestive system, while soluble fibre attracts water and slows digestion, contributing to the "full" feeling. Excessive fibre in canine diets can cause some problems. Many weight management diets use excessive fibre to create a feeling of satiety, but can also affect how the body absorbs other nutrients. This is the case with foods that use a lot of filler ingredients. Be cautious when choosing a weight loss formula. Instead, try trying reducing portions of regular diets, or look for a protein-rich weight management option. Prebiotics, or fermentable carbohydrates, increase healthy digestive bacteria by acting as a source of food for the bacteria. You will often find this type of fiber in the form of Inulin or Chicory in your pet food. Fruits and vegetables, alfalfa, beet pulp, and gums are the most common sources of fermentable carbohydrates added to pet diets. Digestive bacteria directly affect the quality of your pet’s bowel movements, so too little or too much can potentially upset a dog’s digestive system. All carbs are not created equally. High-quality diets should primarily include carbohydrates that have a low GI (glycemic index) value. 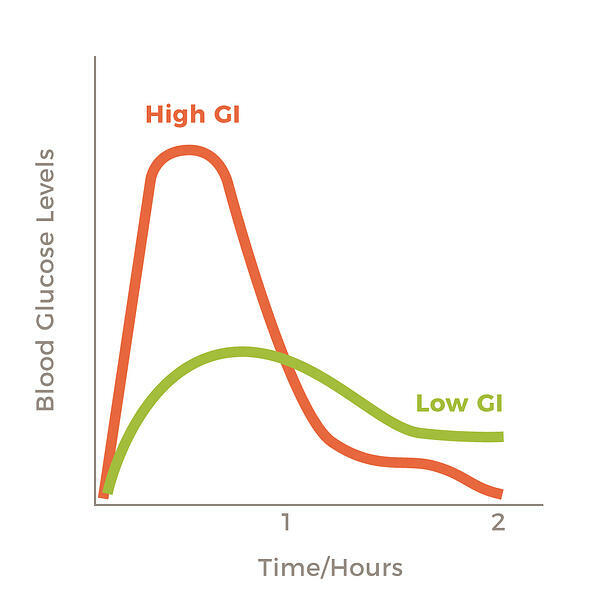 The glycemic index is a scale used to rate foods based on their effects on blood sugar levels in humans. Foods that are classified as high on the glycemic index can also raise blood sugar levels in your pet quickly, as they are broken down easily into energy (glucose). When excess glucose enters the bloodstream, the pancreas is called upon to produce a hormone called insulin. Insulin stores blood sugar in liver cells for later use. As blood sugars levels are depleted, the pancreas once again produces a hormone called glucagon, that signals the release of blood sugar from the liver to be properly distributed throughout the body. Simple carbs, also referred to as simple sugars, can be categorized as either monosaccharides or disaccharides. Monosaccharides, a singular sugar molecule, can be found in three different forms. Fructose has a minimal effect on blood glucose levels. When sourced naturally from fruits and vegetables, fructose can be a healthy low glycemic energy source. This is a good source of energy to see in your pet's food, but should still be fed in moderation. All carbohydrates are converted into glucose to provide energy to the whole body. Although glucose is an effective source of energy, ingredients with high glucose levels rapidly spike blood sugar and stress the pancreas by forcing it to produce large quantities of insulin to manage glucose levels. Disaccharides are a double sugar. Meaning two monosaccharides are bonded to form a new sugar, like sucrose. Sucrose is what we know as table sugar. It is one fructose molecule and one glucose molecule combined. Sourced from either cane sugar, or sugar beets, sucrose is separated back into its original components to be utilized by the dog's body. Maltose is the result of digested starches, like potatoes. It is made of two glucose molecules. The purpose of simple sugars is to provide quick energy to the body, though this is far from the most beneficial method for providing energy. Simple carbohydrates do provide energy and can be found in a variety of formats in most pet food, but are also often overused. The quick digestion of simple sugars provide only short term energy, so food that rely only on simple sugars can negatively effect blood sugar, leaving your dog frequently hungry and lethargic. Complex carbs, which include polysaccharides and oligosaccharides, are composed of three or more saccharides. These carbohydrates contain fibre, vitamins and other nutrients and take much longer to digest. Not only do they provide nutritional value, but they slow digestion limits the effect on blood glucose levels. Whole and ancient grains are a very nutritious complex carb, comprised of mostly fibres and starches. The insoluble fibre in whole grains slows digestion and makes it difficult for digestive enzymes to break down starches into glucose. Whole grains have a slower steadier effect on blood sugar levels. This reduces pressure on the pancreas to dole out the appropriate hormones needed to control blood sugar levels. Gut flora is bacteria in the intestines that aid in digestion by fermenting unused carbohydrates and protect the body from harmful bacteria and infection. Non-fermentable oligosaccharides feed healthy gut flora to maintain appropriate levels. These are often referred to as prebiotics. Prebiotics are used in lots of pet food, especially kibbles, as they are an extremely effective way to increase the foods digestibility. Look for chicory root or inulin in your pet's food, as those are the most common sources. Fats are a required macronutrient in your dog’s diet and play both a facilitative and functional role. Facilitating fats, saturated fat, is an easily digested concentrated source of energy that provides palatability to the food. They also aid in the absorption of fat-soluble vitamins. 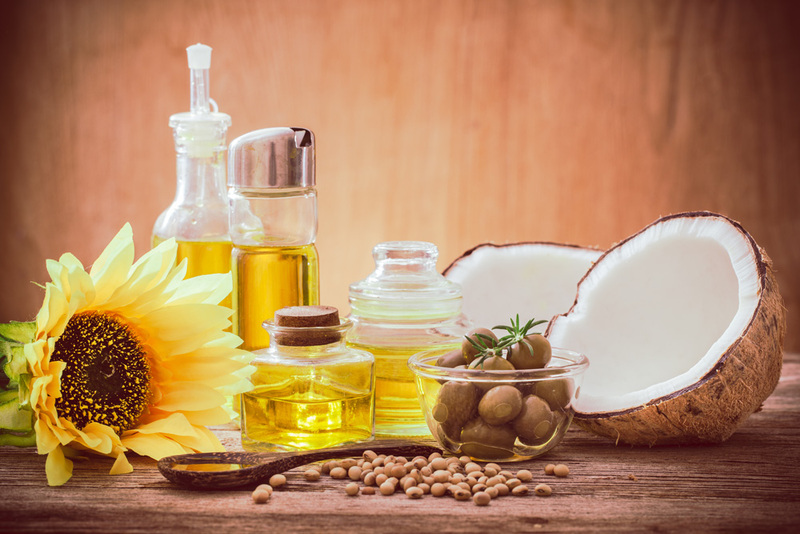 Functional fats, monounsaturated or polyunsaturated, either play an important role in the structural or functional process of cells or can be converted into a component that aids cell function. 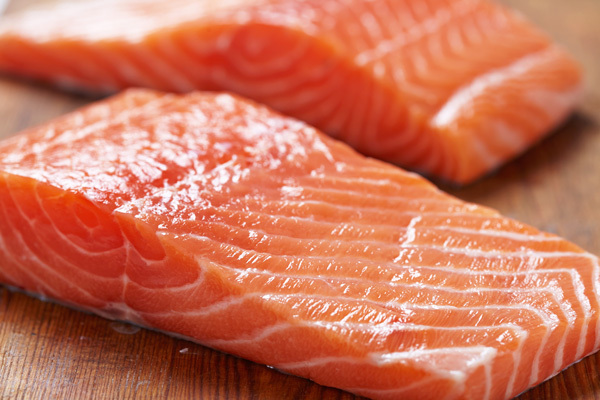 Omega 3 and 6 fatty acids are essential polyunsaturated fats that support cell function. Fatty acids are categorized by their chemical structure. Dogs are able to produce many fatty acids within their bodies, while some need to be supplemented through diet. These are called essential fatty acids, EFA's. Healthy dogs are capable of digesting high quantities of fat in their diets, but calories in should equal energy out. Fat is a concentrated energy source and therefore feeding a high-fat diet to a low activity dog probably means that their bodies are not utilizing all of the calories they are consuming. To learn more about weight management, check out Weight Loss Dog Food: Managing Your Dog's Weight. Canine obesity, caused by excessive calories and sedentary lifestyles, is a precursor for many weight and age-related disorders. Acute pancreatitis, a sudden inflammation of the pancreas, can be linked to obesity and inappropriate high-fat diets. The pancreas has two very important functions, production of hormones like insulin and glucagon, and production of digestive enzymes. When inflammation occurs in the pancreas, digestive enzymes are forced out of the pancreas and into the abdominal cavity. Once released, the digestive enzymes do what they were meant to do; they digest fats, proteins, and carbohydrates. Essentially the pancreatic enzymes begin to slowly digest the pancreas and surrounding tissues. Progression of acute pancreatitis is rapid and life-threatening if left untreated. The disruption in digestion causes vomiting, gastrointestinal distress, and severe dehydration. This does not mean that fat is bad. Fat is a required nutrients in your pet's diet, and limiting fat too much can also have serious effects on your pets health. Many fats are required to provide energy and support many functions in your dog's body. Essential fatty acids are vital to many systems in your dog's body and because they are unable to produce these functional fats on their own, it's extremely important that they are represented in their food or supplements. Fatty acids can be either short, medium or long chain in structure. The main difference is that short and medium chain fatty acids can be more easily digested and used as an energy source for various systems in the body. For example, short chain fatty acids, SCFA, can provide energy for the liver to support detoxification. Typically Long Chain Fatty Acids, LCFA, require digestive enzymes and bile salts to break them down, but often have greater health benefits outside of energy production, like cognitive function, cell structure, and skin and coat health. EPA (Eicosapentaenoic Acid), and DHA (Docosahexaenoic Acid) are the two most important Essential Fatty Acids (EFAs), and are both LCFAs. They are required to maintain healthy cell structure and encourage dilation of blood vessels, which is important for optimal brain function. EPA and DHA are primarily sourced from fish and fish oils, which are commonly used in pet food to ensure complete nutrition, but can also be found in limited quantities in some plant oils. DHA is required for retinal function, heart health and cognitive function, especially during pregnancy, weaning and throughout growth stages. DHA has been shown to slow age-related cognitive deterioration, dementia and more, which is why Omega 3's are especially important during adolescent and senior life stages. EPA is needed to regulate cellular inflammation, including both anti-inflammatory properties and defensive inflammation to protect against allergens and pathogens. The anti-inflammatory properties of Omega 3 fatty acids make them uniquely qualified to aid in allergy problems, digestive upsets, mobility issues and skin and coat care. 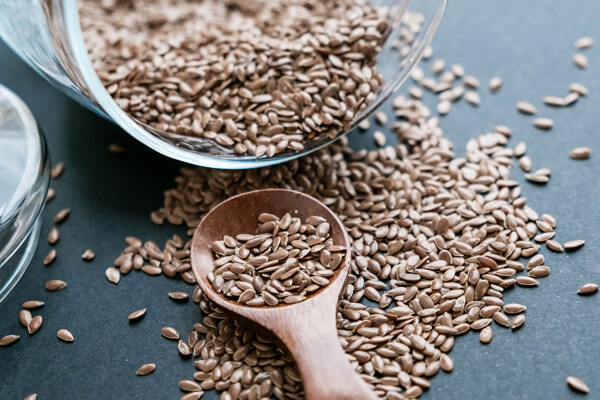 The third EFA for dogs and cats is a short chain fatty acid called Alpha Linoleic Acid, ALA, which is commonly sourced from plants like flaxseed and sunflower oils. ALA is a precursor for EPA and DHA but needs to be converted in the animal's body to achieve the anti-inflammatory effects associated with Omega 3 fatty acids. Unfortunately, dogs are inefficient at this conversion and typically less than 20% of ALA is converted to EPA or DHA. The good news is that newer studies are discovering possible positive effects of ALA on its own, including heart health and bone mineral density. Further testing will need to be conducted to validate these claims, but studies have shown potential risk reductions through feeding trials. The most common Omega 6 fatty acid is Linoleic Acid. Linoleic acid, found primarily in plant matter such as safflower, sunflower and olive oil, is used to condition skin and coat and maintain cognitive function, bone density, and reproductive health. They can also be sourced from animal proteins like chicken and pork but not as abundantly as is in plant matter. A lesser known, but incredibly vital EFA is Arachidonic Acid. The main benefit of this EFA is its pro-inflammatory properties. This sounds a bit backwards, but inflammation is very important to your pets immune system and defensive capabilities. Although AA's job is to encourage inflammation responses, when supplemented correctly and in combination with other EFAs, Arachidonic Acid is an immune system regulator. Other essential Omega 6 fatty acids, GLA and DGLA play a role in inflammation control and skin and coat health. Like LA, they are all abundantly sourced from plant materials and are heavily represented in many commercial pet foods, like kibble. Essential fatty acids maintain the most vital systems in your dog's body, so it is incredibly important that they are being provided in appropriate levels and types of fatty acids. Although each essential fatty acid has its own unique benefits, they work best when used together. It's not just about the ratio either. Look at how much, where they are sourced from, and which EFA's are used. Looking at your pet's diet, you may feed a food that contains fatty acids, but many commercial diets are very carbohydrate heavy, contributing to an improper ratio of omega 3 to 6, as well as the possibility of only some of the essential fatty acids being provided. The ideal ratio of omega 3 and 6 fatty acids for pets is between 1:5-1:10, but higher omega 3's can be necessary to manage specific ailments or conditions. Omega supplementation is beneficial with any diet, but we recommend rotating between animal and plant-based oils to ensure the right amounts of each of the essential fatty acids are regularly present. Now that you know your dog's basic dietary needs, it's time to take a look at their diet and their overall health. If you are concerned that your dog isn't as healthy as they should be, then you may need to consider that their staple diet may be missing a key component. Every pet is different and what may work for one dog, may not be sufficient for another. 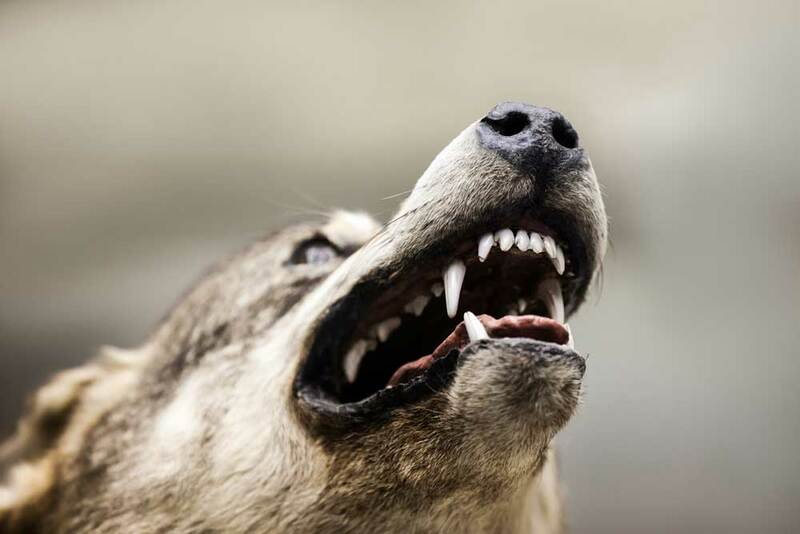 Catering to both carnivorous and omnivorous traits makes canine nutrition very dynamic. There isn't going to be a one-size-fits-all option, regardless of what dog food companies advertise. Instead, you can try different diets with unique features and benefits to find the food that helps your dog thrive. Supplementation can also be helpful, particularly with fibre, omega fatty acids and digestive enzymes. Some dogs need more of these than others and they aren't always available in abundant enough quantities through their diet. So go ahead and try out something new. You may be surprised by the difference an appropriately balanced diet and proper nutritional supplements can yield. Was this guide helpful for you? Share with us in the comments!